The South-east and South-south regions of the country dissolved into a state of anarchy yesterday when thousands of protesters clashed with security forces in Anambra, Imo, Enugu, Abia, Delta, Cross River and Ebonyi States, leading to the deaths of dozens of people, including three policemen, several sustaining injuries, and the arrest of scores of protesters in all the states where the protests took place. The protesters, who were mainly members of the Indigenous People of Biafra (IPOB) and Movement for the Actualisation of Sovereign State of Biafra (MASSOB), had come out en masse to mark Biafra Day in memory of the former leader of the defunct Biafra Republic, the late Chukwuemeka Odumegwu Ojukwu. Ojukwu had led the secession of the old Eastern Region and declared the region the Republic of Biafra on May 30, 1967. His attempt to break away from Nigeria led to the three-year Nigerian Civil War and Biafra’s defeat. In recent years, however, MASSOB and later IPOB have emerged, with its members attempting to resuscitate the ghost of Biafra. During yesterday’s rally in Onitsha, Anambra State, a combined team of the military and police clashed with members of IPOB during the celebration of Biafra Day in the commercial city. The clash left about 30 people dead and many injured. It was equally gathered yesterday that over 50 members of the Biafran group were arrested by the military and taken to the 302 Cantonment of the Nigerian Army in Onitsha. Following the mayhem, the commercial city of Onitsha, especially the Nkpor axis, was locked down with the security operatives taking over the roads. The gun battle, which led to the killings, it was learnt, started when an IPOB member allegedly shot at a soldier who was patrolling where the protesters had converged to begin a procession in honour of the late Ojukwu around the Upper Iweka area of Onitsha. Thick smoke also enveloped the Onitsha metropolis as a result of bonfires lit by the protesters on major roads and streets of the city. The Public Relations Officer of IPOB, Emma Powerful, alleged yesterday that security operatives killed over 30 members of the group, while 50 persons were arrested and whisked to an unknown destination, adding that many others were seriously injured. He said that the arrest of their members started at about 2am yesterday. “They (the military) were moving around in their Hilux vehicle with a native doctor when we were celebrating Biafra without any weapons. Does it mean that we have no fundamental rights?” he asked. Reacting to the mayhem that ensued in Onitsha, the Anambra State Government condemned any illegal demonstration in the state. A statement from the state Commissioner for Information and Communications Strategy, Ogbuefi Tony Nnachetta, said: “The attention of the Anambra State Government has been drawn to illegal demonstration by a group of individuals causing anxiety at the Nkpor/Onitsha axis of the state. “The law enforcement agencies are fully engaged in the situation and are currently working to restore normalcy and ensure free movement for all law abiding citizens. In Asaba also, no fewer than seven persons were confirmed dead following the rally held by members of MASSOB which turned violent in the Delta State capital yesterday. The acting Police Public Relations Officer (PPRO) in Delta, Mr. Charles Muka, who confirmed this in a statement, added that the police recorded two casualties. He said in a statement that five members of MASSOB were killed by military officers who clashed with the protesters along the Asaba-Onitsha expressway in Asaba. The police stated that the military arrested and brought eight members of MASOB to the police station and “are now in custody in Asaba”. According to the police spokesman, the protesters turned violent and attacked the policemen deployed to monitor the protest, killed two and injured two others. “To our surprise, they started attacking our men and at the Okwe junction in Abraka area of Asaba, the group killed a police corporal and took his AK47 rifle. “Also along the Dennis Osadebey Way in Asaba, they wounded a police officer and took his anti-riot gun. “This brings the casualties to two with two others injured on the side of the police. “The protesters also attacked military vehicles along the Asaba-Onitsha expressway which left four members of the group dead, while eight others were arrested and brought to the police headquarters,” Muka said. He added that a pregnant woman was hit by a stray bullet during the fracas but rushed to the Federal Medical Centre, Asaba, where she was treated. He advised parents and guardians to counsel their children and wards to follow the path of peace and pursue their agenda constitutionally. However, the attempt by MASSOB members in Ikom town, about 300 kilometres from Calabar, the Cross River State capital, to celebrate the 49th anniversary of the declaration of the State of Biafra, suffered a setback as youths from the town kicked against the protest. Though the MASSOB sypathisers had gathered close to the Ikom township Stadium, from where they were meant to march through many streets in the town, they were restricted to just the New Okomo Layout, about 400 metres from where had they taken off. 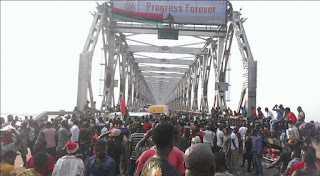 Scores of the MASSOB members dressed in uniforms and carrying the Biafra flag, nonetheless conducted themselves peacefully, during the short street rally. The zonal leader of MASSOB in the state, Mr. Samuel Okah, while addressing the protesters, said the rally was in commemoration of the 1967 declaration of the sovereign State of Biafra by its leader, Ojukwu. Okah said the peaceful rally was to send a message that even though Ojukwu did not succeeded in establishing a sovereign state through violent means, the dream of actualising a Biafran state could be achieved through non-violent means. Okah urged President Muhammadu Buhari to listen to the agitators for a state of Biafra and allow them to form a country they can call their own. But the Vice-President, National Youth Council of Nigeria, Prince Ayuk Ojong, described the rally as a flop, stating that he mobilised his members to stop the MASSOB members from using Ikom for their unpatriotic act. Ojong said Ikom Local Government Area was not part of Biafra, hence the stance of the youths of the area to stop the rally from gaining momentum. Just like in Ikom, pro-Biafra protesters in Abakiliki, the Ebonyi State capital, were stopped by the state police command monday. MASSOB leader, Mr. Uche Mmadu, in a statement, said it was a day of honouring fallen and living heroes whose services could never be forgotten. But the police command said it uncovered plans that the protest was a plot by miscreants to cause mayhem in the state. In a statement, the state Police Public Relations Officer, Mr. George Okafor, said that the command got intelligence reports that pro-Biafra groups had gathered at Nkaliki Primary school in Abkaliki, but police swiftly arrived at the scene and stopped the gathering. Okafor said that about 92 members led by one Vincent Nwamini and several other sub-leaders were arrested. The police spokesman added that items recovered from the suspects included Biafra flags and banners with the inscription “United States of Biafra Independence celebration 30th May, 2016”. He assured residents of the preparedness of the command to maintain law and order, stressing that protection of lives and property in the state was not negotiable. The command appealed to law abiding citizens to go about their normal and lawful businesses and refrain from joining issues with organisations and groups proscribed by the federal government. Hundreds of pro-Biafra protesters of Igbo origin also stormed Warri, Delta State, calling on the president to grant them freedom. The protesters in a peaceful rally to commemorate the 49th anniversary of the declaration of the State of Biafra, said the protest was in remembrance of the late Ojukwu, who initiated the struggle 49 years ago. According to him, the whole world has now come to realise that the Republic of Biafra is a must, adding that all the requirements meant for the actualisation of the Republic of Biafra had been met. The protesters appealed to Igbo leaders who are derailing the struggle to come out and support the movement, insisting that the effort was not meant to hurt anybody nor cause anarchy or confusion. They decried indiscriminate killings of innocent persons by herdsmen in the southern part of the country, and called on Fulani cattle rustlers to stop stealing cattle.